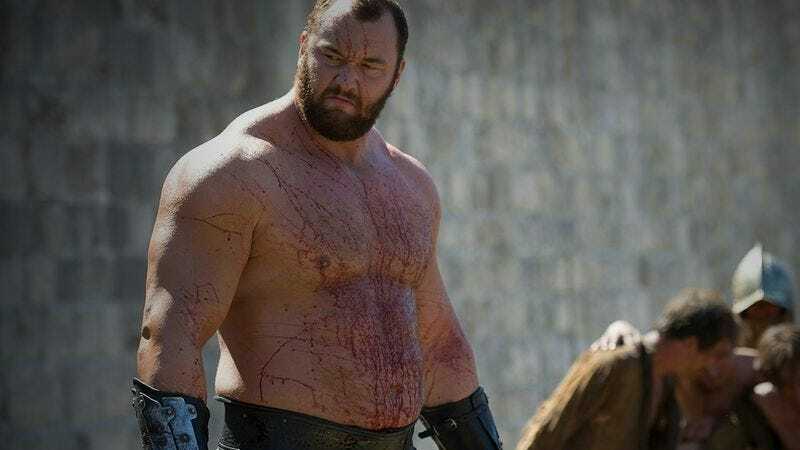 Although he gained a certain level of notoriety for playing Ser Gregor “The Mountain” Clegane on Game Of Thrones, Hafþór Júlíus Björnsson has mostly harnessed his physical powers for good, i.e., Strong Man competitions in Europe and his native Iceland. But the team behind the Kickboxer: Vengeance isn’t content to let Björnsson chuck hybrid cars over waterfalls, or whatever feat of strength he usually accomplishes at these events. According to Coming Soon, Björnsson is set to play the villain in the sequel to John Stockwell’s reboot that hasn’t even been released yet. The response to the film—which stars Jean-Claude Van Damme as the kickboxing instructor, not pupil—has been reportedly already been “staggering,” which prompted producer Rob Hickman to start assembling the cast for a second act (that had better include some dancing). Hickman told Coming Soon he’s excited to continue the franchise with Björnsson as the Big(gest) Bad in Kickboxer: Retaliation. Filming is scheduled to begin in Thailand in May, to give Björnsson just enough time to juggle cement mixers or otherwise compete for the title of World’s Strongest Man this spring.